Preprints (earlier versions) of this paper are available at http://preprints.jmir.org/preprint/9366, first published Nov 08, 2017. Background: In the era of information overload, are big data analytics the answer to access and better manage available knowledge? Over the last decade, the use of Web-based data in public health issues, that is, infodemiology, has been proven useful in assessing various aspects of human behavior. Google Trends is the most popular tool to gather such information, and it has been used in several topics up to this point, with health and medicine being the most focused subject. Web-based behavior is monitored and analyzed in order to examine actual human behavior so as to predict, better assess, and even prevent health-related issues that constantly arise in everyday life. Objective: This systematic review aimed at reporting and further presenting and analyzing the methods, tools, and statistical approaches for Google Trends (infodemiology) studies in health-related topics from 2006 to 2016 to provide an overview of the usefulness of said tool and be a point of reference for future research on the subject. Methods: Following the Preferred Reporting Items for Systematic Reviews and Meta-Analyses guidelines for selecting studies, we searched for the term “Google Trends” in the Scopus and PubMed databases from 2006 to 2016, applying specific criteria for types of publications and topics. A total of 109 published papers were extracted, excluding duplicates and those that did not fall inside the topics of health and medicine or the selected article types. We then further categorized the published papers according to their methodological approach, namely, visualization, seasonality, correlations, forecasting, and modeling. Results: All the examined papers comprised, by definition, time series analysis, and all but two included data visualization. A total of 23.1% (24/104) studies used Google Trends data for examining seasonality, while 39.4% (41/104) and 32.7% (34/104) of the studies used correlations and modeling, respectively. Only 8.7% (9/104) of the studies used Google Trends data for predictions and forecasting in health-related topics; therefore, it is evident that a gap exists in forecasting using Google Trends data. Conclusions: The monitoring of online queries can provide insight into human behavior, as this field is significantly and continuously growing and will be proven more than valuable in the future for assessing behavioral changes and providing ground for research using data that could not have been accessed otherwise. Big data are characterized by the 8 Vs : volume (exponentially increasing volumes) , variety (wide range of datasets), velocity (high processing speed) , veracity, value [4,5], variability, volatility, and validity . Big data have shown great potential in forecasting and better decision making ; though handling these data with conventional ways is inadequate , they are being continuously integrated in research  with novel approaches and methods. The analysis of online search queries has been of notable popularity in the field of big data analytics in academic research [8,9]. As internet penetration is continuously increasing, the use of search traffic data, social media data, and data from other Web-based sources and tools can assist in facilitating a better understanding and analysis of Web-based behavior and behavioral changes . The most popular tool for analyzing behavior using Web-based data is Google Trends . Online search traffic data have been suggested to be a good analyzer of internet behavior, while Google Trends acts as a reliable tool in predicting changes in human behavior; subject to careful selection of the searched-for terms, Google data can accurately measure the public’s interest . Google Trends provides the field of big data with new opportunities, as it has been shown to be valid  and has been proven valuable [14,15], accurate , and beneficial  for forecasting. Therefore, great potential arises from using Web-based queries to examine topics and issues that would have been difficult or even impossible to explore without the use of big data. The monitoring of Web-based activity is a valid indicator of public behavior, and it has been effectively used in predictions [18,19], nowcastings , and forecasting [17,21,22]. Google Trends shows the changes in online interest for time series in any selected term in any country or region over a selected time period, for example, a specific year, several years, 3 weeks, 4 months, 30 days, 7 days, 4 hours, 1 hour, or a specified time-frame. In addition, different terms in different regions can be compared simultaneously. Data are downloaded from the Web in “.csv” format and are adjusted as follows: “Search results are proportionate to the time and location of a query: Each data point is divided by the total searches of the geography and time range it represents, to compare relative popularity. Otherwise places with the most search volume would always be ranked highest. The resulting numbers are then scaled on a range of 0 to 100 based on a topic’s proportion to all searches on all topics. Different regions that show the same number of searches for a term will not always have the same total search volumes ” . Healthcare is one of the fields in which big data are widely applied [24,25], with the number of publications in this field showing a high increase . Researchers have placed a significant focus on examining Web-based search queries for health and medicine related topics . Data from Google Trends have been shown to be valuable in predictions, detection of outbreaks, and monitoring interest, as detailed below, while such applications could be analyzed and evaluated by government officials and policy makers to deal with various health issues and disease occurrence. The monitoring and analysis of internet data fall under the research field of infodemiology, that is, employing data collected from Web-based sources aiming at informing public health and policy . These data have the advantage of being real time, thus tackling the issue of long periods of delay from gathering data to analysis and forecasting. Over the past decade, the field of infodemiology has been shown to be highly valuable in assessing health topics, retrieving web-based data from, for example, Google [29,30], Twitter [31-34], social media [35,36], or combinations of ≥2 Web-based data sources [37,38]. As the use of Google Trends in examining human behavior is relatively novel, new methods of assessing Google health data are constantly arising. Up to this point, several topics have been examined, such as epilepsy [39,40], cancer , thrombosis , silicosis , and various medical procedures including cancer screening examinations [44,45], bariatric surgery , and laser eye surgery . Another trend rising is the measurement of the change in interest in controversial issues [48,49] and in drug-related subjects, such as searches in prescription  or illicit drugs [51,52]. In addition, Google Trends data have been used in examining interest in various aspects of the health care system [53-55]. Apart from the above, Google Trends data have also been useful in measuring the public’s reaction to various outbreaks or incidents, such as attention to the epidemic of Middle East Respiratory Syndrome , the Ebola outbreak , measles , and Swine flu , as well as the influence of media coverage on online interest . Google queries for the respective terms have been reported to increase or peak when a public figure or celebrity is related [61-65]. Google Trends has also been valuable in examining seasonal trends in various diseases and health issues, such as Lyme disease , urinary tract infection , asthma , varicose vein treatment , and snoring and sleep apnea . Furthermore, Deiner et al  showed that indeed there exists the same seasonality in Google Trends and clinical diagnoses. What has also been reported is that seasonality in Google searches on tobacco is correlated with seasonality in Google searches on lung cancer , while online queries for allergic rhinitis have the same seasonality as in real life cases . Thus, we observe that, apart from measuring public interest, Google Trends studies show that the seasonality of online search traffic data can be related to the seasonality of actual cases of the respective diseases searched for. As mentioned above, Google queries have been used so far to examine general interest in drugs. Taking a step further, Schuster et al  found a correlation between the percentage change in the global revenues in Lipitor statin for dyslipidemia treatment and Google searches, while several other studies have reported findings toward this direction, that is, correlations of Web-based searches with prescription issuing [74-76]. The detection and monitoring of flu has also been of notable popularity in health assessment. Data from Google Flu Trends have been shown to correlate with official flu data [77,78], and Google data on the relevant terms correlate with cases of influenza-like illness . In addition, online search queries for suicide have been shown to be associated with actual suicide rates [80,81], while other examples indicative of the relationship between Web-based data and human behavior include the correlations between official data and internet searches in veterinary issues , sleep deprivation , sexually transmitted infections , Ebola-related searches , and allergies [86,87]. Furthermore, Zhou et al  showed how the early detection of tuberculosis outbreaks can be improved using Google Trends data; while suicide rates and Google data seem to be related, the former are suggested to be a good indicator for developing suicide prevention policies . In addition, methamphetamine criminal behavior has been shown to be related to meth searches . Finally, recent research on using Google Trends in predictions and forecasting include the development of predictive models of pertussis occurrence , while online search queries have been employed to forecast dementia incidence  and prescription volumes in ototopical antibiotics . Given the diversity of subjects that Google Trends data have been used up for until this point to examine changes in interest and the usefulness of this tool in assessing human behavior, it is evident that the analysis of online search traffic data is indeed valuable in exploring and predicting behavioral changes. In 2014, Nuti et al  published a systematic review of Google Trends research including the years up to 2013. This review was of importance as the first one in the field, and it reported Google Trends research up to that point. The current review differs from Nuti et al’s in two ways. First, it includes 3 more full years of Google Trends research, that is, 2014, 2015, and 2016, which account for the vast majority of the research conducted in this field for the examined period based on our selection criteria. Second, while the first part of our paper is a systematic review reporting standard information, that is, authors, country, region, keywords, and language, the second part offers a detailed analysis and categorization of the methods, approaches, and statistical tools used in each of this paper. Thus, it serves as a point of reference in Google Trends research not only by subject or topic but by analysis or method as well. The aim of this review was to include all articles on the topics of health and medicine that have used Google Trends data since its establishment in 2006 through 2016. 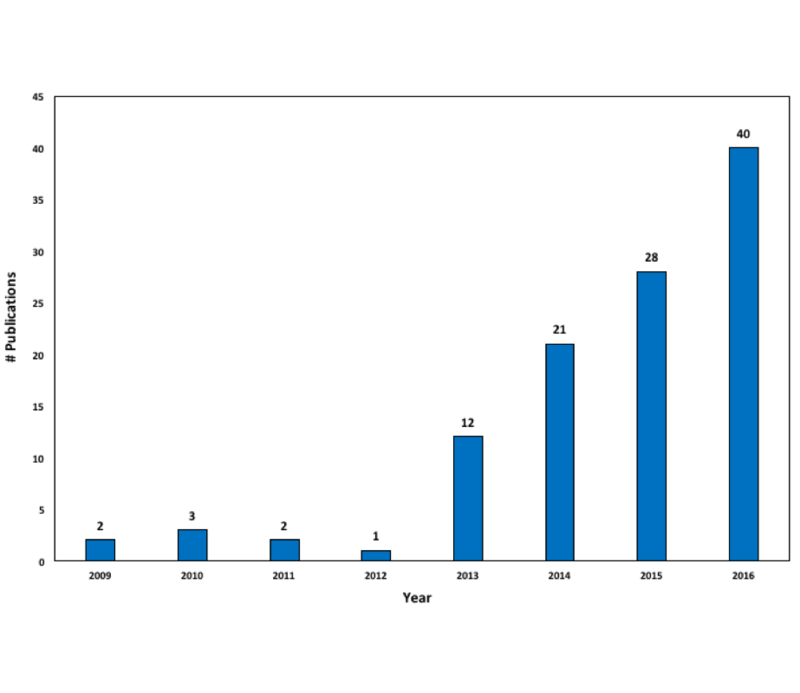 We searched for the term “Google Trends” in the Scopus  and PubMed  databases from 2006 to 2016, and following the Preferred Reporting Items for Systematic Reviews and Meta-Analyses guidelines (Figure 1), the total number of publications included in this review was 109. Figure 1. Preferred Reporting Items for Systematic Reviews and Meta-Analyses flow diagram of the selection procedure for including studies. First, we conducted a search in Scopus for the keyword “Google Trends” in the “Abstract-Title-Keywords” field for “Articles,” “Articles in press,” “Reviews,” and “Conference papers” from 2006 to 2016. Out of the available categories, we selected “Medicine,” “Biochemistry Genetics and Molecular Biology,” “Neuroscience,” “Immunology and Microbiology,” “Pharmacology, Toxicology, and Pharmaceuticals,” “Health Profession,” “Nursing,” and “Veterinary.” The search returned 102 publications. Second, we searched for the keyword “Google Trends” in PubMed from 2006 to 2016, which provided a total of 141 publications. Excluding the duplicates, which numbered 84 in total, 159 publications met our criteria. Excluding the ones that did not match the criteria for article type (10 publications) and the ones that did not fall inside the scope of health and medicine (40 publications), a total of 109 studies were included in this review. Note that 5 studies were written in a language other than English and were therefore not included in the quantitative part or in the detailed analysis of the methods of each study. Figure 2 depicts the number of publications by year from 2009 to 2016: 2 in 2009, 3 in 2010, 2 in 2011, 1 in 2012, 12 in 2013, 21 in 2014, 28 in 2015, and 40 in 2016. The selected studies are further analyzed according to their methodologies, and the gaps, advantages, and limitations of the tool have been discussed so as to assist in future research. Thus, we provide a more detailed categorization of the examined papers according to the main category that they belong to, that is, visualization and general time series analysis, seasonality, correlations, predictions or forecasting, modeling, and statistical method or tool employed. Note that a study can fall into >1 category. The categorization by individual medical field is not applicable due to the high number of individual topics. Table 1 consists of the description of each parameter used to classify each study. Figure 2. Google Trends' publications per year in health-related fields from 2009 to 2016. Authors Includes the surname of the authors, date of publication, and link to the reference list (eg, Smith et al, 2016 ). Period Refers to the time-frame for which Google Trends data were retrieved and used in the study (eg, 2004-2015). Region Refers to the country or countries or region (eg, USA; Worldwide; Oceania) that Google Trends data were extracted for. Language Refers to the language in which the Google Trends search was conducted (eg, search for the Italian word Si). Keywords Basic keywords are included in this category, mostly referring to the health topic examined and important keywords used to describe it. Visualization (V) Includes any form of visualization, that is, figures, maps, and screenshots (eg, screenshots of the Google Trends website). Seasonality (S) Studies that have explored the seasonality of the respective topic are included. Correlations (C) Studies that have examined correlations are included in this category. Correlations may be between Google Trends data and official data, among Google Trends time series, or between Google Trends and other Web-based sources’ time series. Forecasting (F) This category includes studies that conducted forecasting of either Google Trends time series or diseases, outbreaks, etc, using Google Trends data, independent of the method used. Modeling (M) Studies in this category conducted some form of modeling using Google Trends data. Statistical Tools (St) This category includes the studies that used statistical tools or tests, eg, t test. Tools and methods for statistical modeling, (eg, regression), are not included in this category but only in the category of Modeling. Table 1. Description of the parameters used for classification. Multimedia Appendix 1 consists of the first classification of the selected studies [27,39-57,59-93,96-144]; there are 104 in total, as the studies of Kohler et al , Orellano et al , Cjuno et al , Tejada-Llacsa , and Yang et al  are written in German, Spanish, or Chinese, and thus are not included in the more detailed categorization and analysis. All the examined papers involve, by definition, time series analysis, and almost all include some form of visualization. Only 8.7% (9/104) studies used Google Trends data for predictions and forecasting, and 23.1% (24/104) used them for examining seasonality, while correlations and modeling were performed in 39.4% (41/104) and 32.7% (34/104) studies, respectively. As the category of forecasting and predictions exhibits the least number of studies, it is evident that a gap exists in the literature for forecasting using Google Trends in health assessment. As is evident in Multimedia Appendix 1, Google queries have been employed up to this point in many countries and several languages. Figure 3 shows a worldwide map by examined country for assessing health and medicine related issues using Google Trends data up to 2016. Worldwide, the studies that explore topics related to the respective terms number 23 in total. As far as individual countries are concerned, US data have been employed in the most (60) studies, while other countries that have been significantly examined include the United Kingdom (15), Australia (13), Canada (9), Germany (8), and Italy (7). The four most examined countries are English-speaking ones. The reasons for this could include that Google Trends, though not case-sensitive, does take into account accents and spelling mistakes; therefore, for countries with more complicated alphabets, the analysis of Web-based data should be more careful. In addition, other factors that could play a significant role and are taken into account when choosing the countries to be examined using online search traffic data are the availability of official data, the openness of said data, any internet restrictions or monitoring in countries with lower scores in freedom of press or freedom of speech, and internet penetration. The rest of the analysis consists of the further breaking down of the initial categorization to include the respective methods that were used for examining seasonality, correlations, forecasting, and performing statistical tests and estimating models, along with a concise introduction to each of these methods and how they were used to assess health issues. Table 2 shows the methods used to explore seasonality; Tables 3 and 4 present the methods used to examine correlations and perform predictions and forecasting, respectively. Finally, Tables 5 and 6 list the modeling methods and other statistical tools employed in health assessment using Google Trends. The most popular way to explore seasonality is to use visual evidence and examine and discuss peaks, as shown in Table 2. Furthermore, several studies have used cosinor analysis [8,69,134,138,142], which is a time series analysis method for seasonal data using least squares. Apart from seasonality , analysis of variance (ANOVA) has been also used for geographical comparisons between regions or countries [49,51,68,93] and between differences in monthly data . It is a test used for examining if significant differences between means exist. In the case of 2 means, t test is the equivalent to ANOVA. The Kruskal-Wallis test is also a popular method for examining seasonality using Google Trends [57,68,113]. It is a nonparametric, independent of distribution test, for continuous as well as ordinal-level dependent variables, employed when the one-way ANOVA assumptions do not hold, that is, for examining statistically significant differences between ≥3 groups. It uses random sample with independent observations, with the dependent variable being at least ordinal. Figure 3. Countries by number of Scopus and PubMed publications using Google Trends. Other methods of exploring seasonality include the nonparametric tests (independent of distribution) Wilcoxon signed rank [18,113] and Mann-Whitney U test , which are used for comparing data in different seasons or time periods when the equivalent parametric t tests cannot be used. The latter has been also used by some studies to compare weekly data  and differences among regions . For examining correlations (Table 3), the vast majority of the studies used the Pearson correlation coefficient, which examines the strength of association between 2 quantitative, continuous variables, employed when the relationship is linear. The Spearman rho (rank-order) correlation, the second most used method, is the nonparametric version of the Pearson correlation, has also been used to explore seasonality between time series . Spearman correlation coefficient (denoted by ρ or rs) measures the levels to which 2 ranked variables (ordinal, interval, or ratio) are related to each other. Cross-correlations are used for examining the relationship of 2 time series, while simultaneously exploring if the data are periodic. It is often employed in correlating Google Trends data with observed data [50,82,90,135] and between different Google search terms , while it can be also used for examining linear and temporal associations of seasonal data . Cross-correlations have been also used in forecasting, where Wang et al  showed that cross-correlations of new dementia cases with Google Trends data can assist with the forecasting of dementia cases, and Solano et al  forecasted the suicide rates 2 years ahead using Google queries. The autocorrelations are basically cross-correlations for one time series, that is, a time series cross-correlated with itself. The Kendall’s tau-b test correlation coefficient is a nonparametric alternative to Pearson and Spearman correlations and is used to measure the strength and direction of the relationship between 2 (at least ordinal) variables. It has been employed by 1 study  to examine the correlations between Google Trends data and the results of a paper interview survey. The Spearman-Brown prediction (or prophecy) formula is used to predict how reliable the test is after changing its length. It has also been employed by only 1 study  to explore the relationship between railway suicide and Google hits. The generalized linear model estimates the linear relationship between a dependent and ≥1 independent variables. It was used by Domnich et al  to predict influenza-like illness morbidity, with the exploratory variables being “Influenza,” “Fever,” and “Tachipirin search volumes,” along with the Holt-Winters method and the autoregressive moving average process for the residuals. Holt-Winters is a method employed in exploring the seasonality in time series, and for predictions, the autoregressive moving average (also called the Box-Jenkins model) is a special case of the autoregressive integrated moving average, used for the analysis of time series and predictions. Autoregressive integrated moving average is a commonly used method for time series analysis and predictions [55,63,86,92,141], the latter having also been assessed by linear regressions and modeling [88,91]. Multivariable regressions are used to estimate the relationship of ≥2 independent variables with a dependent one. In Google Trends, they have been used to relate Ebola searches, reported cases, and the Human Development Index  and to study the relationship between climate and environmental variables and Google hits . Hierarchical linear modeling is a regression of ordinary least squares that is employed to analyze hierarchically structured data, that is, units that are grouped together, and it has been employed by 1 study so far . The Mann-Kendall test, which is the nonparametric alternative test to the independent sample, has been used to show the statistical differences of peaks  and to detect trends . Finally, the t test is used to compare 2 sample means of the same population, and it has been employed for comparing Google searches with the baseline period  and to examine the statistical differences of peaks . Table 2. Methods for exploring seasonality with Google Trends in health assessment. Many studies have employed Google Trends for visualizing the changes in online interest or discussing peaks and spikes [60,62,123,124]. Brigo and Trinka  and Brigo et al  have studied the search volumes for related terms, Chaves et al  and Luckett et al  have explored terms related to the studied topic, and Davis et al  have examined related internet searches. Other approaches include the reporting of the polynomial trend lines  and investigation of statistically significant differences in yearly increases . In addition, “Google Correlate” has been used to explore related terms [91,138]. Finally, several studies have used other sources of big data, namely, Google News [43,63,80], Twitter [43,54,61,63,108], Yandex , Baidu , Wikipedia [43,63], Facebook and Google+ , and YouTube [43,54,63]. Google is the most popular search engine. However, other Web-based sources are used or even preferred to Google in some regions; therefore, many studies use data from these sources to examine general interest in the respective subjects, compare them to Google Trends data, or use them together as variables. Table 3. Methods of exploring correlations using Google Trends in health assessment. Table 4. Forecasting and predictions using Google Trends in health assessment. aARIMA: autoregressive integrated moving average. bARGO: autoregression with Google search data. Table 5. Statistical modeling using Google Trends in health assessment. Table 6. Statistical tests and tools using Google Trends in health assessment. With internet penetration constantly growing, users’ Web-based search patterns can provide a great opportunity to examine and further predict human behavior. In addressing the challenge of big data analytics, Google Trends has been a popular tool in research over the past decade, with its main advantage being that it uses the revealed and not the stated data. Health and medicine are the most popular fields where Google Trends data have been employed so far to examine and predict human behavior. This review provides a detailed overview and classification of the examined studies (109 in total from 2006 through 2016), which are then further categorized and analyzed by approach, method, and statistical tools employed for data analysis. Figure 4. The four steps toward employing Google Trends for health assessment. The vast majority of studies using Google Trends in health assessment so far have included data visualization, that is, figures, maps, or screenshots. As discussed in the analysis, the most popular way of using Google Trends data in this field is correlating them with official data on disease occurrence, spreading, and outbreaks. The assessment of suicide tendencies and (prescription or illegal) drug-related queries has been of notably growing popularity over the course of the last years. As is evident, the gap in the existing literature is the use of Google Trends for predictions and forecasting in health-related topics and issues. Though data on reported cases of various health issues and the respective Google Trends data have been correlated in a large number of studies, only a few have proceeded with forecasting incidents and occurrences using online search traffic data. Measure the general Web-based interest. Detect any variations or seasonality of Web-based interest, and proceed with examining any relations between actual events or cases. Correlate Web-based search queries among them or with official or actual data and events. Predict, nowcast, and forecast health-related events, outbreaks, etc. 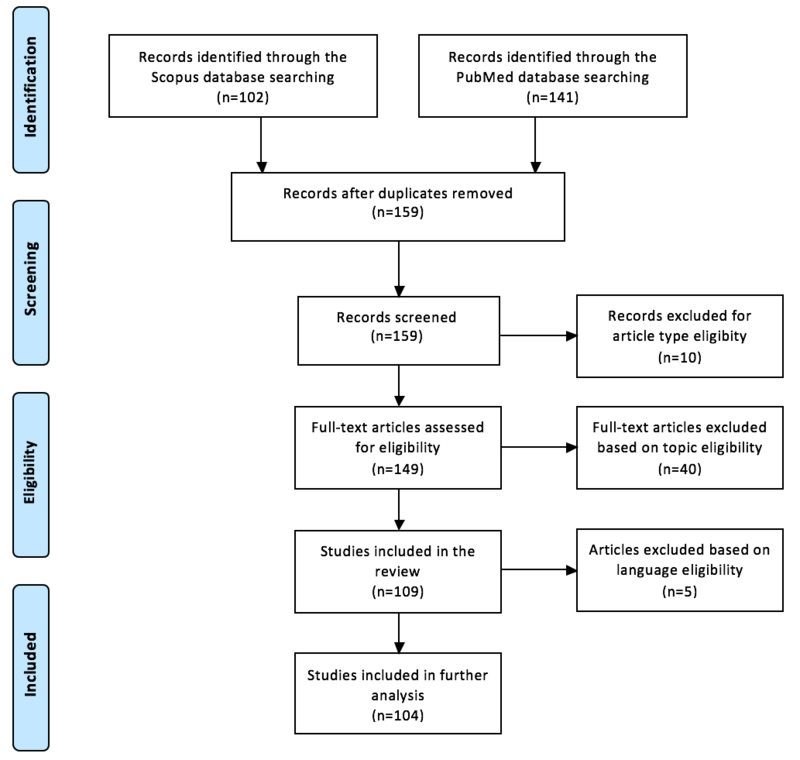 This review followed the Preferred Reporting Items for Systematic Reviews and Meta-Analyses guidelines for selecting the examined papers from the Scopus and PubMed databases. Though this includes the majority of papers published on the topic from 2006 to 2016, the studies that are not indexed in these databases or are not indexed based on the selection criteria used in this review were not included in further analysis. In addition, as is evident in Figure 2, research using Google Trends data has shown a significant increase from each year to the next since 2013. This review included studies published in Google Trends research through 2016. However, there are several studies published in 2017 and 2018 that are not included. This review provides, at first, an overall description of each examined study, which is standard review information. The second part is a classification and assessment of the methodology, tools, and results of each study. Though the first part mainly reports what is included in the methodology of each study, the second part could include a bias, as it is the authors’ assessment and categorization of the methods employed based on the results obtained after a very careful and thorough examination of each individual study. This review consists of the studies published from 2006 to 2016 on Google Trends research in the Scopus and PubMed databases based on the selected criteria. The aim of this review was to serve as a point of reference for future research in health assessment using Google Trends, as each study, apart from the basic information, for example, period, region, language, is also categorized by the method, approach, and statistical tools employed for the analysis of the data retrieved from Google Trends. Google Trends data are being all the more integrated in infodemiology research, and Web-based data have been shown to empirically correlate with official health data in many topics. It is thus evident that this field will become increasingly popular in the future in health assessment, as the gathering of real time data is crucial in monitoring and analyzing seasonal diseases as well as epidemics and outbreaks. Han S, Chung H, Kang B. It is time to prepare for the future: Forecasting social trends. Communications in Computer and Information Scienc 2012:e2012-e2031. Noar S, Ribisl K, Althouse B, Willoughby J, Ayers J. Using digital surveillance to examine the impact of public figure pancreatic cancer announcements on media and search query outcomes. Journal of the National Cancer Institute - Monographs 2013:188-194. Schuster N, Rogers M, McMahon JL. Using search engine query data to track pharmaceutical utilization: a study of statins. The American journal of managed care 2010;16(8):215-219. ARIMA: autoregressive integrated moving average. ©Amaryllis Mavragani, Gabriela Ochoa, Konstantinos P Tsagarakis. Originally published in the Journal of Medical Internet Research (http://www.jmir.org), 06.11.2018.